My philosophy of orchid cultivation is what's called benign neglect. I'm fortunate to live in a climate where all I have to do is put them in a good spot and let nature take its course. If I try to care for them they die and when I ignore them they're fine. Well it's not quite so simple as that, but it's close. I mist them during the dry season and repot them every two years or so. Aside from that, they are on their own. It's a good thing they're around and I get reminded of that from time to time. I think yesterday was the worst day in human history. I swear, people formed a line for the chance to be mean to me. Horrible day. Horrible day! I came home late and paced and growled like a caged animal. I went out onto my patio and something happened to make all of that drift away. I walked out the door and stepped into a cloud of the most delightful fragrance on the planet. My Brassavola nodosa is in bloom and nothing I've ever encountered comes close to the scent of these otherwise nondescript white and green flowers. 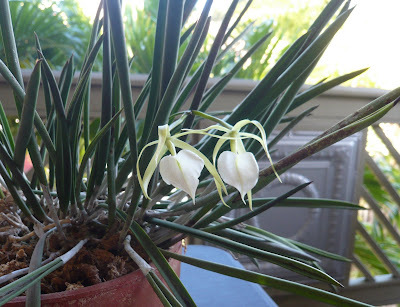 B. nodosa blooms in the winter here and it's fragrant only on warmer, wind-free nights. Last night was one such night. I stood under a waning gibbous moon and inhaled a scent of such complexity I had to sit down to process it. It's almost as if it's a combination of the blossom of a key lime with a flutter of vanilla and a black pepper end note. If I stand farther away, it's kind of caramelly and chocolatish with a whiff of nutmeg thrown in. At mid range it's a buttery jasmine with a hint of damson plum. Man, I could spend an hour circling the thing and inhaling, dreaming of moonlit nights in exotic lands. Ahhh. One good whiff and I was transported to a cliff side terrace in Grenada, a balcony in old Rangoon or a moonlit night in the same highlands of southern Mexico where B. nodosa originated. Having a bad day? Stick your nose in a blooming Brassavola nodosa and it won't matter anymore.